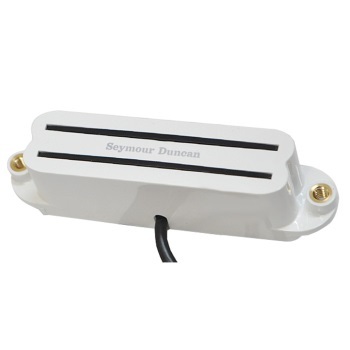 High output single-coil-size "rails" humbucker. Great for classic rock, garage, punk, heavy rock, thrash, classic metal and nu-metal. One of the highest output and most popular pickups we make. The two thin blades, strong ceramic magnet and powerful coil windings give you the incredible sustain and a fat, full sound that's needed for playing heavier rock music. This pickup responds to the subtlest finger movements. Comes with four-conductor hookup cable. Available for both bridge and neck/middle positions. For an incredibly versatile guitar, use an SHR-1b in the bridge position along with an SVR-1n Vintage Rails in the middle and an SCR-1n Cool Rails in the neck. For all well-balanced instruments. Works equally well with maple and rosewood fingerboards. Choose white, black, cream and parchment housing.